British police investigating three failed car bombings in London and Glasgow have searched 19 locations and arrested eight people, including six doctors, one of them arrested in Australia, reports CBS News. CBS News confirms the eighth arrest was made Monday in Brisbane, Australia. The 27-year-old unidentified man is also a doctor who had been working in United Kingdom. Police are executing a number of search warrants across Queensland, including one at the hospital where the suspect worked, Australian authorities said. More arrests are expected. Speaking in Canberra Tuesday, Australian Prime Minister John Howard said the doctor arrested is an Indian national. Howard at the same time revealed that a second doctor is being interviewed in relation to information given to counterterror authorities by the first. Officials say both doctors worked at the Gold Coast Hospital in southeast Queensland and were both recruited from Liverpool. The Indian doctor was arrested at the state capital Brisbane airport as he was about to leave the country Monday night. The second doctor was being interviewed by police Tuesday but has not been arrested. Still another medical trail, reports CBS News foreign correspondent Mark Phillips, leads to Jordan, where Mohammad Asha - who was arrested Saturday in northern England - got his medical training. British media reports named the second detained doctor as Bilal Abdulla, an Iraqi who was believed to have been arrested at Glasgow airport. The only two people arrested at the airport were the ones driving the Jeep Cherokee that crashed through the entrance. According to the British General Medical Council's register, a man named Bilal Talal Abdul Samad Abdulla was registered in 2004 and was trained in Baghdad. A third doctor, believed to be from India, was arrested in Liverpool Monday and is suspected of involvement in the Glasgow attack and in the two failed car bombing attempts in London, adds Phillips. Phillips reports that investigators have called the burned Jeep Cherokee recovered from the airport entrance, "a gold mine" of evidence. Two other men were arrested Monday as suspects in the car bomb attack on the airport, British authorities said. Strathclyde police said two men, aged 25 and 28, had been detained under the Prevention of Terrorism Act. Meanwhile, U.S. security officials tell CBS News correspondent Bob Orr that they have found no U.S. connections to the U.K. terror incidents. At this point, the FBI is not pursuing any domestic leads in this case, and government officials are referring all questions to British authorities, adds Orr. Mohammed Asha seems a very unlikely terrorist, reports CBS News correspondent Sheila MacVicar. And although he has not yet been charged, there are suggestions that he is central to the plot to blow up two massive car bombs in the heart of London last Friday, and that he may be closely linked to the two men who attacked Glasgow airport on Saturday. Asha was arrested along with a 27-year-old woman, believed to be his wife, as they drove on a major highway in Cheshire, in northwest England, in a joint swoop by officers from London and Birmingham. Interviewed by CBS News at his home in Amman, Jordan, Asha's father said his son attended The Jubilee School in Amman, an elite high school initially founded by Jordan's Queen Noor in 1984 for children who show great academic promise. He graduated with straight A's in 1998. Asha graduated from Jordan University's medical program in the summer of 2004 — at the top of his class — and then moved to Birmingham with his family, where he continued his medical studies. He was most recently a resident neurosurgeon at the University Hospital of North Staffordshire, in northern England. CBS News confirms that in 2004 the current head of al Qaeda in Iraq was instructed by then-head Abu Musab al-Zaraqawi to recruit these people to move to the West and easily integrate until time came to strike. CBS News has found a posting dated Feb. 20, 2006, by someone using the name Mohammed Asha, of Jordanian nationality, on an Islamic Internet chat forum. Referring to a cartoon depicting the Prophet Mohammed published by European newspapers, the post reads: "We have had to put up with you in the West for a long time. But now, after you insulted our prophet, we shall not forgive you." The posting was found on a forum that did not appear to represent or be a regular platform exclusively for extremist view points. An earlier statement posted online, signed by a "group of intellectuals," expresses support for the resistance in the Palestinian territories and condemns some Palestinian officials for calling it "terrorism". The name of Mohammed Asha appears among the signatories. The statement, found on the website of the al-Shaab newspaper, is dated July 19, 2002. Another Internet forum — a discussion of the 1948 war between Israel and the Palestinians, during which time many Palestinian families fled as refugees to Jordan — contained an audio file attributed to Asha. CBS News was not immediately able to retrieve the audio. The forum was dated May/June 2006, and was titled as an oral discussion of the "disaster in al-Dawayima," referring to a town near Hebron in the West Bank. Asha's father said his son was not affiliated with radical groups while he lived in Jordan. The doctor's brother Ahmed told The Associated Press in Jordan he had heard the media reports and said his sibling "is not a Muslim extremist, and he's not a fanatic." "It's nonsense because he has no terror connections," he said. "This continues to be a fast-moving investigation and I am grateful to the public for their perseverance and support during these difficult times," Assistant Chief Constable John Malcolm said as he announced the sixth and seventh arrests Monday. 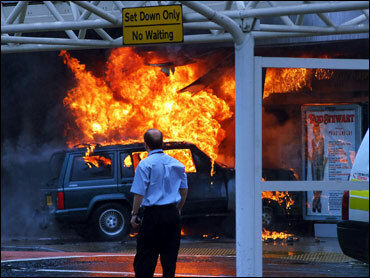 Police carried out a second controlled explosion Monday at the Royal Alexandra hospital in Paisley, Scotland, where the driver of a gas-filled jeep that rammed into the front of Glasgow's airport on Saturday was being treated, under guard, for severe burns. Police earlier cordoned off a temporary housing building for staff at the hospital and called in the bomb squad. Police conducted the first controlled explosion Sunday on a vehicle parked at the hospital which they said also could be linked to the plot. British media organizations reported that all of the suspects in custody were thought to be of Middle Eastern origin. A realtor in Glasgow has said that police were on the trail of the airport bomb suspects minutes before the attack. Daniel Gardiner of the Let-It agency said officers had contacted his company after tracking phone records linked to the foiled London car bomb attacks. He said police left a card at the home of a colleague on Saturday, asking him to get in touch with authorities. "The card was put through prior to the incident at Glasgow Airport," said Gardiner, adding that police were interested in the tenant who had taken a six-month lease on a house. Police on Sunday searched a property rented by Gardiner's company in Houston, near Glasgow Airport. Gardiner said police interviewed staff at the Let-It office and took away all documentation about the tenant. "We are learning a great deal about the people involved in the attacks here in Glasgow and in the attempted attacks in central London. The links between them are becoming ever clearer," Peter Clarke, head of Scotland Yard's counterterrorist unit, said in Scotland. "I'm confident, absolutely confident, that in the coming days and weeks we will be able to gain a thorough understanding of the methods used by the terrorists, the way in which they planned their attacks and the network to which they belong." "Al Qaeda has imported the tactics of Baghdad and Bali to the streets of the U.K.," said Lord Stevens, Brown's terrorism adviser, referring to the 2002 and 2005 attacks on the Indonesian resort island that killed more than 200 people and the daily car bombings in the Iraqi capital.